Flickering lights from cell phone cameras and the constant blaring of horns among the red-clad aficionados at a sold out National Stadium Tuesday night set the scene for a high-energy World Cup qualifier between two of the region’s powers. 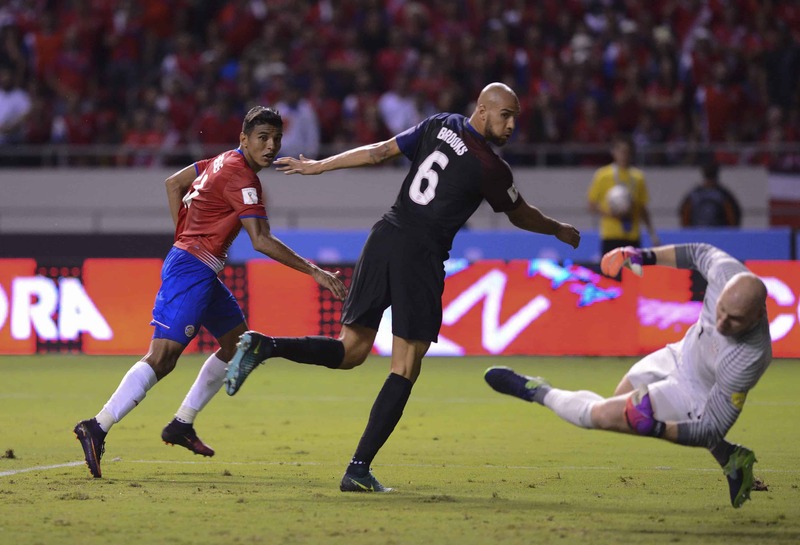 Costa Rica didn’t disappoint its faithful as it went on to clobber the United States 4-0, giving La Sele the perfect payback for a June loss of the same margin on U.S. soil. More importantly, the win gives La Sele an all-important six points to start Hexagonal play, the last round of qualifying ahead of the 2018 World Cup. Costa Rica came out as the aggressor in the opening minutes Tuesday night, led by striker Johan Venegas, who got the start over Marco Ureña. The 27-year-old forward proved Coach Óscar Ramírez’s decision correct as he constantly wrecked havoc on the United States’ backline. Minutes after a chippy start with U.S. defender John Brooks, where the two had to be separated at one point, Venegas blew by the tall defenseman; his near goal in the 7th minute was denied by a kick save from keeper Brad Guzan. Venegas, who plays professionally in Major League Soccer for the Montreal Impact, had about five close calls on goal before finally breaking the scoreless tie in the 44th minute. Fellow MLSer Christian Bolaños chipped up a beautiful ball in the box where Venegas got enough space from Brooks to head it home. Though Costa Rica’s star goalie Keylor Navas wasn’t threatened in the opening half, he got fortunate when a Bobby Wood cross that went through his grasp didn’t find the feet of another U.S. attacker before slipping out of the area. The game was Navas’ first in National Stadium since the March qualifying win over Jamaica and the Real Madrid keeper helped ignite a defense that looked completely different from June’s 4-0 Copa América loss to the U.S.
As an undermanned defense continued to hold a U.S. attack that looked surprisingly lifeless, the Ticos offense took its 1-0 halftime lead and exploded with a barrage of goals in the second half. When Venegas went to the ground in the 65th minute, Ramírez subbed on fellow forward Joel Campbell. The 24-year-old star took no time in making his presence felt as he helped start the action on a second goal where captain Bryan Ruíz broke free on the right side before feeding Bolaños for a header in front of the net. Campbell then came back with the third and fourth goals of the night on nearly identical breakaways where he beat Brooks and was left one-on-one with a helpless Guzan. Ramírez has been subbing Campbell in late in the past few games, and the move again payed off as the forward gave La Sele a second gear following Venegas’ departure. The United States now drops to 0-9-1 all-time in qualifiers played in Costa Rica and will be in desperate search for some points in the next leg of Hexagonal play. The lopsided loss will undoubtedly raise questions over the future of Coach Jurgen Klinsmann, who may not be able to survive the wait until World Cup qualifying picks up again in March. Costa Rica, which leads the CONCACAF group, will return to World Cup qualifying with a very tough visit to Mexico on March 24.